PIZZA HUT’S BIGFOOT BLIMP ACCIDENT. All summer long I’ve harboured these mysterious feelings of neglect but I finally figured out why. 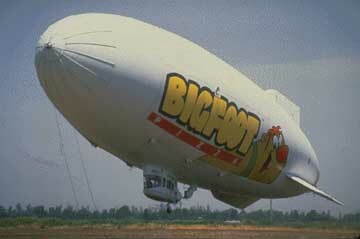 In the midst of our Independence Day celebrations we forgot that July 4th was also the 21st anniversary of Pizza Hut’s BIGFOOT blimp accident. Shame on us as a society for not remembering this fateful day in history that the massive pressured airship promoting Pizza Hut’s behemoth-sized pizza deflated and crash-landed on an upscale apartment in Manhattan. If you weren’t paying attention, on July 4th, 1993 the buzz around New York City wasn’t surrounding fireworks, bbq’s and the pride of our nation. Instead people were running for their lives as a 160-foot deflated blimp reading BIGFOOT PIZZA with a dog-boy looking illustration on it’s side smothered down on their homes like an extraterrestrial spaceship coming to feast on mankind. My condolences will forever go out to the shocked and horrified tenants and onlookers involved in this disaster. Luckily only the crew sustained minor injuries, but the mental trauma must have shaken plenty of people. An article in the NY Times stated that some sunbathers on the roof were scrambling to get to a lower level and that apartments were darkened from the blimp hanging limply over the side of the building. I’m still curious to know if people would have been as shaken up had it been a Dominos blimp or Papa John’s blimp. Let’s face it, a large majority of us loathe Pizza Hut. If eating their pizza sounds like a nightmare, imagine what laying out in the sun and looking up in the sky to see a gargantuan-sized Pizza Hut flying-logo-beast coming to crush you feels like? THAT is a Pizza Hut nightmare. But still not as bad as the after effects of eating their pizza? Maybe not. The only thing that would have made this story better was if the blimp had been filled with 200,000 cubic feet of oozy, liquid cheese (with all their toppings swimming around inside, including the hot dog stuffed crust). It would have exploded on impact and turned Manhattan’s yuppie community into a Pizza Hut toxic wasteland. 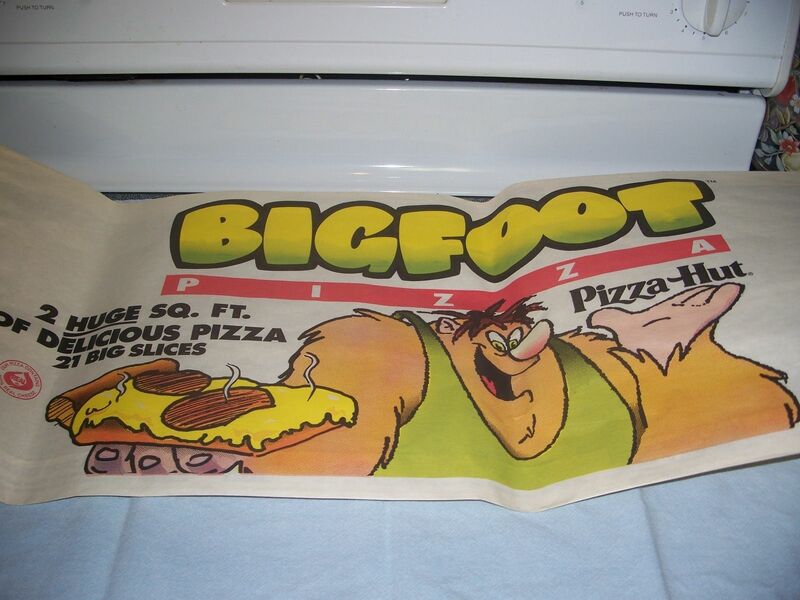 The actual event did end up being the talk of the town for about a month and it’s amusing story resulted in higher-than-expected sales for the BIGFOOT pizza itself. 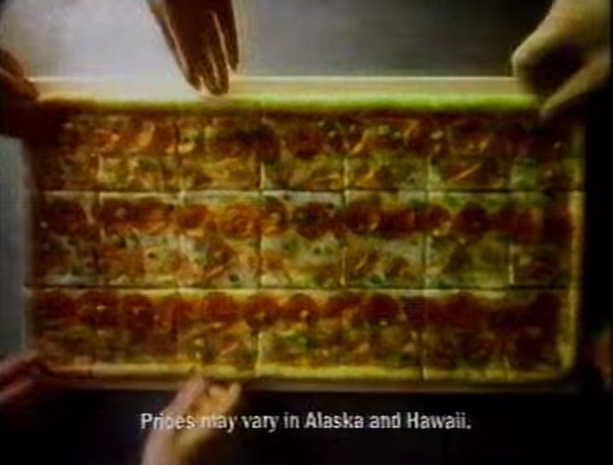 In case no one remembers the pizza, it measured 2 feet long by 1 foot wide…certainly big and fat enough to give an adult cardiac arrest but crucial for birthday parties, treehouse hangouts and Friday night movie junk-fests. Hahahaa this is hilarious Uncle T!! I can’t wait for tomorrow’s Friday night movie junk-fest with my own personal Pizza Hut pizza! My TNUC beer koozie will come in handy to hold my Silver Bullet super tight. I’ll be tuning into re-runs of USA’s Up All Night with Rhonda Shear. Marko, hope you had a bodacious Friday night! I was flipping in between USA’s Up All Night and TNT’s MONSTERVISION ! Dude, no pictures of the actual disaster/miracle hiding out there somewhere? Wow Matt – incredible stuff. Thanks for sharing! Do you happen to still have the photos/footage from the disaster? Or are those the ones that are currently on YouTube? I’ve been searching high + low for PHOTOS of the blimp but haven’t dug up anything yet. Sorry for the delay. I’d have to search through old VHS but I’m sure they’re around.